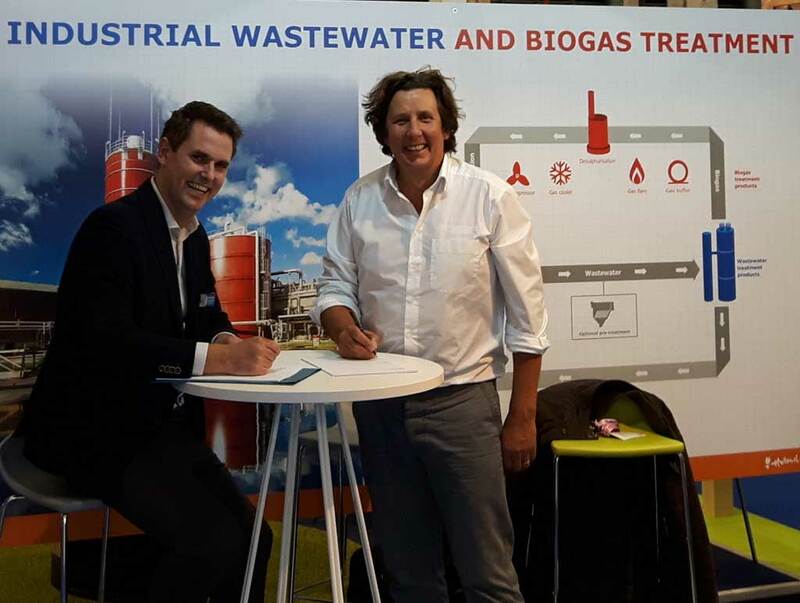 Worcester-based Aquabio Ltd and Econvert Water and Energy BV – based in Heerenveen in The Netherlands – have signed a UK collaboration agreement to deliver high rate anaerobic digestion technology into the UK industrial marketplace. Econvert’s technology complements Aquabio’s own MBR and water reuse technology to provide a complete portfolio to industrial clients. Aquabio already has its own anaerobic MBR process which is particularly suited to situations where higher rate and granular sludge based AD processes are not appropriate – for example, those with very high COD concentrations, high TSS, FOG and salinity – or a customer is looking to maximise organic conversion and gas cogeneration. To deal with situations where higher rate ‘granular’ anaerobic pre-treatment processes are required, Aquabio can now provide very cost effective treatment combinations with its own aerobic post treatment and tertiary processed to meet the highest water quality requirements. Econvert’s portfolio of processes include UASB – or Upflow Anaerobic Sludge Blanket; EGSB – Expanded Granular Sludge Bed; Econvert-IR; Anaerobic Internal Recirculation Technology. Econvert –ECO is also available which is specially designed for this anaerobic wastewater treatment of relatively small amounts of industrial wastewater. This is perfect for situations with wastewater discharges of 400-2500kg of COD per day. In addition to water processes the Econvert-Dsulph process also provides industrial and municipal customers biological biogas desulphirisation to remove hydrogen sulphide (H2S). When there are high concentrations of HS2 in the biogas this is a very cost effective process, which significantly reduces long operating costs when compared to non-biological scrubbing. Laboratory testing and on site pilot trial units are available when investigation and pre-contract treatability evaluation is required. For further information please contact Terry McCarthy, Managing Director, Aquabio Ltd on 01905 641966. This entry was posted in Anaerobic Digestion. Bookmark the permalink.